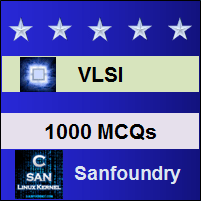 This set of VLSI Multiple Choice Questions & Answers (MCQs) focuses on “Propogation Delays”. Explanation: Propogation time is directly proportional to square of the propogation distance (x2 ). It is the time taken by the signal to move from input port to output port. Explanation: The total resistance can be given as the product of nrRs where r is the relative resistance per section in terms of Rs. Explanation: Total capacitance can be given as the product of nc(square Cg) where c is the relative capacitance per section in terms of square Cg. Explanation: The overall delay is directly proportional to n2 , where n is the number of pass transistors in series. Explanation: The number of pass transistors connected in series can be increased by connecting buffer in between. Explanation: Buffer is used for long polysilicon runs because it increses the speed and reduces the sensitivity to noise. Explanation: The overall delay is directly proportional to the relative resistance r. Overall delay is given as product of n^2rcƮ. Explanation: Small disturbanes of noise switches the inverter stage between 0 and 1 or vice versa. It disturbs the normal operation or behaviour. Explanation: The buffer speeds up the rise time of propogated signal edge. A buffer is the combination of two inverters in which one output is fed to the other as the input. Explanation: Overall delay increases as n increases where n is the number of pass transistors connected in series.